Welcome to this month’s edition of DIY Decorating Tips & Tricks…and this month we’re talking trays. Trays are absolutely one of my favorite go-to decor accessories. 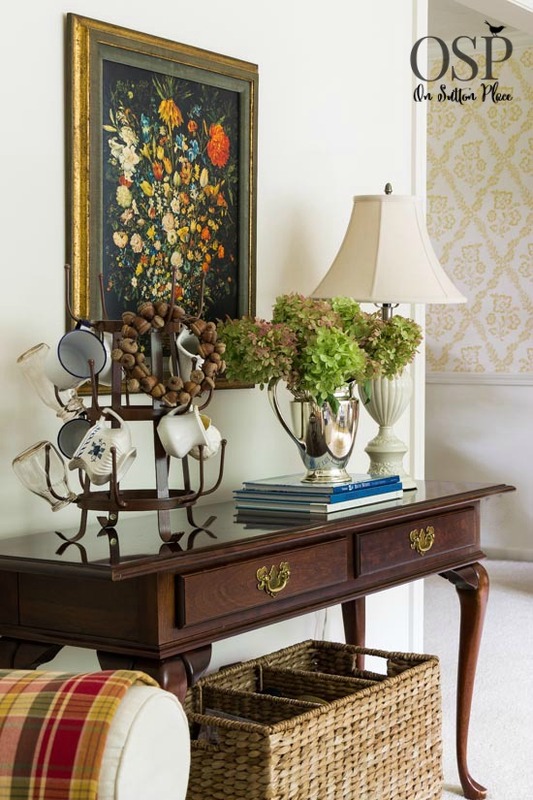 A great tray can turn a jumble of odds and ends into a cohesive vignette…in about 5 minutes. I have a small collection of different trays…no two are alike. They are different colors and textures but they all move around my house and they seem to fit in where ever they land. (I will list some sources at the end for similar items.) If I had to pick a favorite it would be this wood tray that I painted Annie Sloan Old White. Right now it’s resting on a small chest in my entry. It’s been on my coffee table and dining room table too. It’s the added layer that is so important when you are trying to get that cozy, homey feeling. Layering is easy and anyone can do it. All you need is a tray. My second favorite tray is this woven beauty from Pottery Barn. 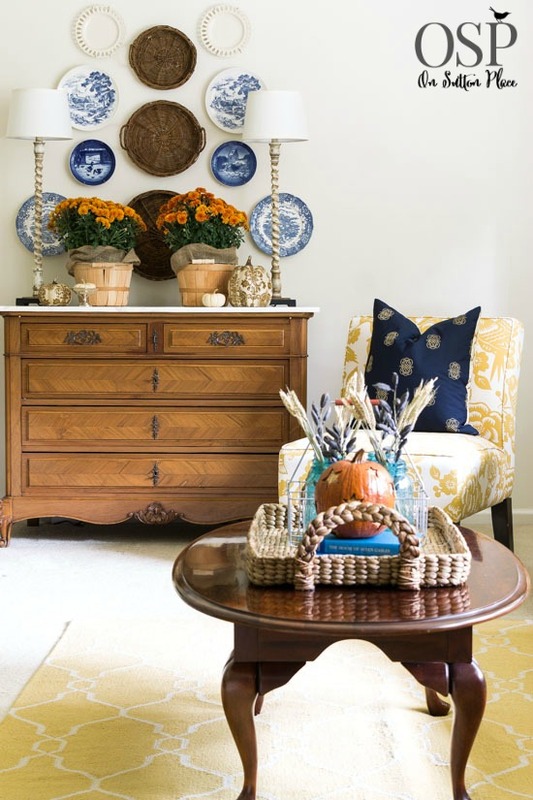 My favorite spot so far for this tray is my coffee table…although I’ve tried it on my ottoman and dining room table. It works well on the coffee table because it’s a bit lower and smaller. Without the tray, the items on the coffee table would get lost and make no sense. Nestled in the tray, the blue jars bring out the blue books. 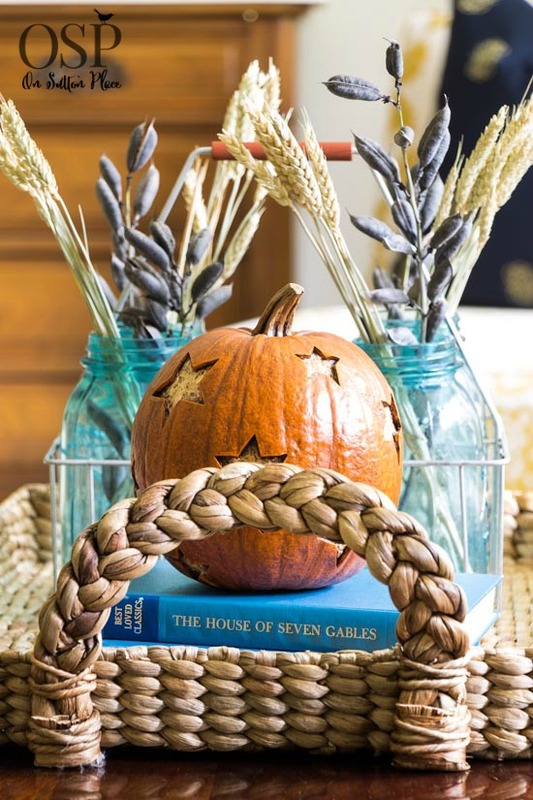 The pumpkin is the surprise element and pop of color. Trays don’t always have to be on flat surfaces…they make perfect wall art. The set of three willow trays hanging on the wall add texture and break up the blue a little. They added a darker tone as well that I thought was perfect for Fall. When I needed a small round tray to add to my Thanksgiving Tablescape, the largest tray was plucked off the wall. (I simply added back one of the ironstone plates to the blank space on the plate wall.) If you don’t have any trays handy, other items can take their place. Books make amazing trays. You can customize the height by stacking and add color at the same time. I think it works best to remove the jackets from the books and then add your accessories. 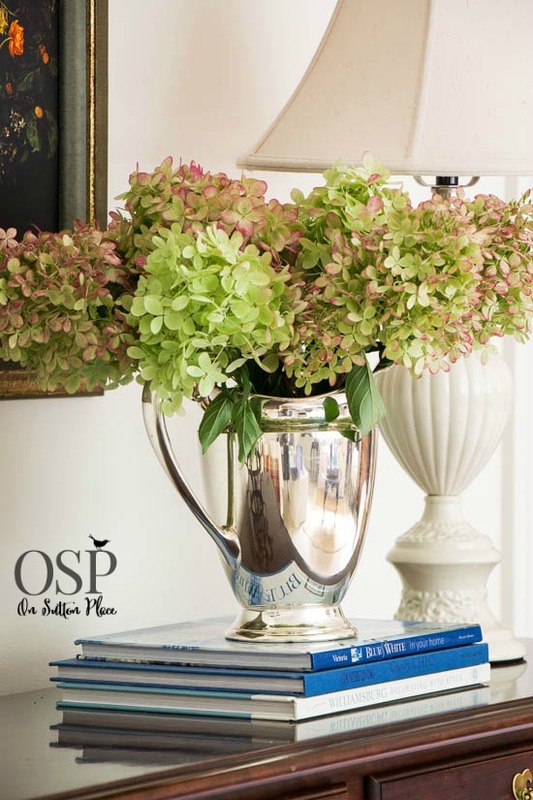 Here I used books to ground a silver pitcher of dried hydrangeas. The whole thing would have worked fine without the books…but the books add just a bit more interest and color. I have a few silver trays that were wedding gifts and I sprinkle them around my house. 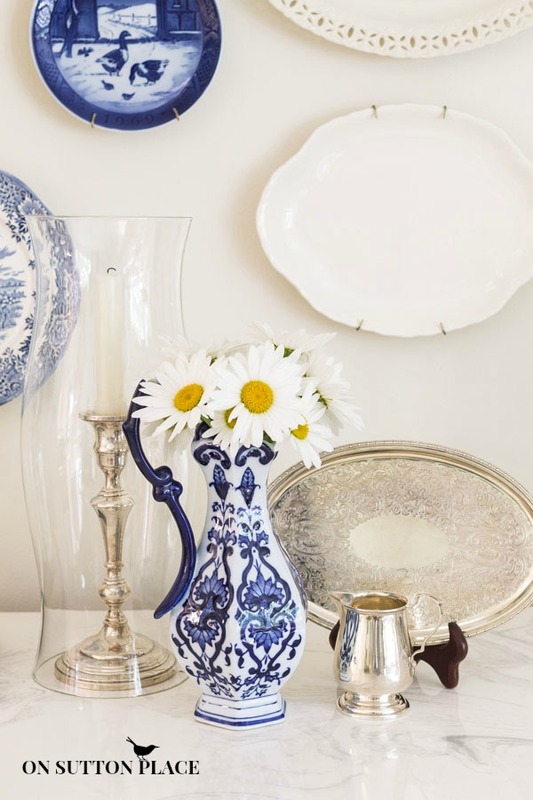 Silver trays are classic and pretty much go with any decor. They can be found for next to nothing at thrift shops because people don’t want to clean them. I still clean my silver but lots of people don’t. It’s stunning either way. 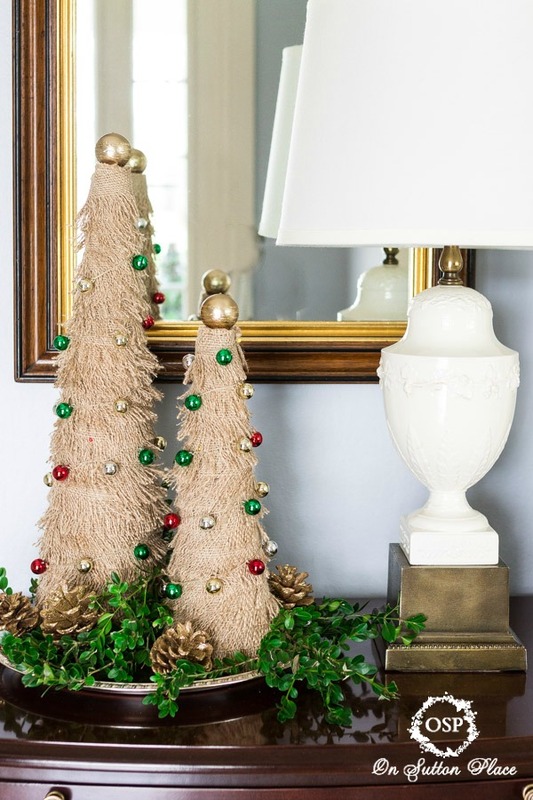 I mixed silver and gold last Christmas when I used a silver tray to corral my fringed burlap Christmas trees. Silver trays are so versatile too…I use them for just about anything. Don’t forget about smaller trays…they can be used much like plates. Placed on an easel any small tray can become a lovely decor accessory. One of my favorite places to use a tray is on my kitchen counter. In fact I use multiple trays. My counter space is really limited and trays keep everything contained and neat. I use a wooden box-like tray beside my stove and another flat tray to stow my coffee stuff. 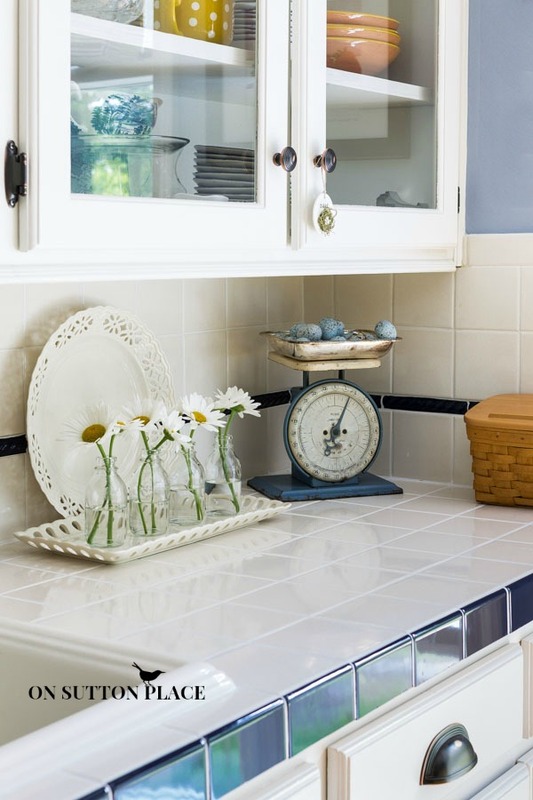 This rectangular tray with the daisies is actually a plate that does double duty. Plates can be trays…and trays can be plates. Look around and I bet you have one of the two (or a few books) to try out this easy way to layer. 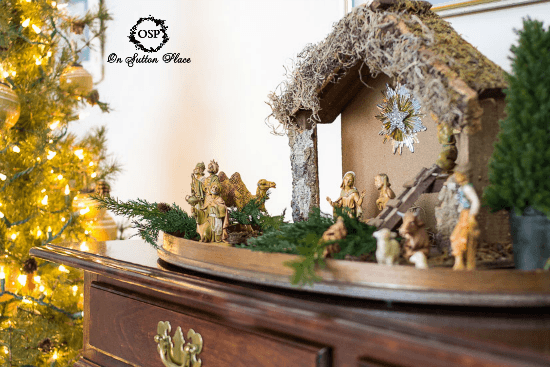 I hope I’ve given you some inspiration for adding trays to your home and if you are already using them, I hope you came away with a fresh idea. I want to share one more picture…it’s from last Christmas and of my Nativity set. I had forgotten that I placed it on an old, vintage, oval wooden tray that belonged to my mother-in-law. I think I’ll do the same thing again this year. at no additional cost to you, by advertising and linking to Amazon.com. I am a silent reader from Brazil. Today I just couldn’t go away before writing a comment. Your work is amazing and the dedication you have to your home, your family, your brand and your costumers/ followers can be seen in every single picture you take. Congratulations and thanks for sharing your gift with us! I enjoyed your thoughts on decorating with trays. I dont often do it, but I can see where it might make stuff look more cohesive. Thanks! I have been enjoying your blog. I love this post using trays. Great ideas and great use of meaningful things you already have. Great post and there are some very pretty ideas of inspiration for me. I really like the way you use footed pieces to hold a pumpkin. Very creative. Help is what i needed,and it arrived today,now i can finish and revisit my trays. They just did not look right so thanks and have a great day. These trays are lovely. I am trying my hand at building some rustic type trays for the fun of it. You have given me some ideas on how to stage them for photos when I do a post on it. Thank you. Wow Ann! You certainly know how to decorate with trays! LOVE the idea of books as a tray… brilliant my friend! Every tray gives a room a different “feel”.Your mix of willow trays and blue and white dishes on your wall is swoonworthy. What a gorgeous combination!!! LOVE LOVE LOVE working with you!!! I am impressed as usual. You work with what most of us already have and make it a meaningful vignette. You always spark my creative juices. Happy Thanksgiving to you and yours. Beautiful and love all your ideas! You’ve done it again, Ann! You a such an inspiration and you shared your talent using these lovely trays everywhere~~~thank you so much. gladly awaiting receipt of two pillow covers! I purchased your Pottery Barn tray after seeing yours. Absolutely love it ! 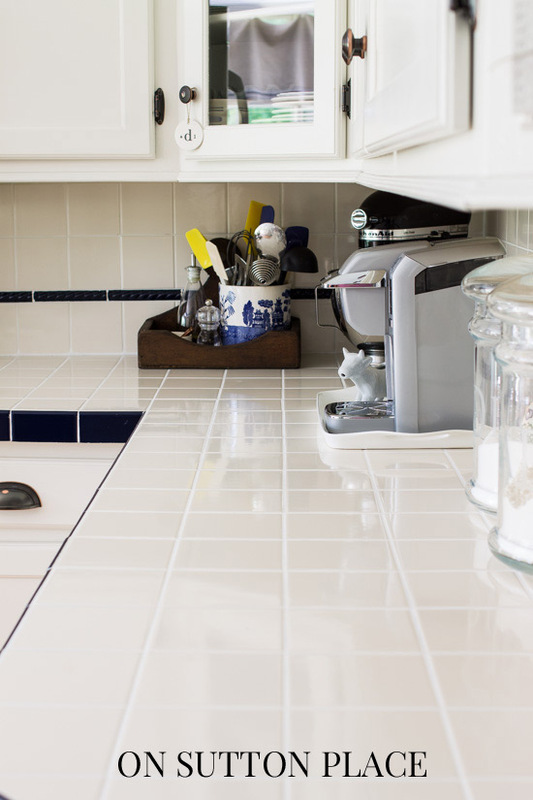 Love all of those trays, and how come your house always looks so neat and clean? Oh wait… I know that trick too. But I am sure in your case, it really is clean off camera. I used Pellegrino too on my trays. Love your greenery that you used also. I just love trays too, Ann. You know who often has them for reasonable prices? Hobby Lobby! That’s something I’ve been seeing there for the last year or so. Glad about it too because sometimes trays are expensive. I love your creative use of trays and the things you use for trays! 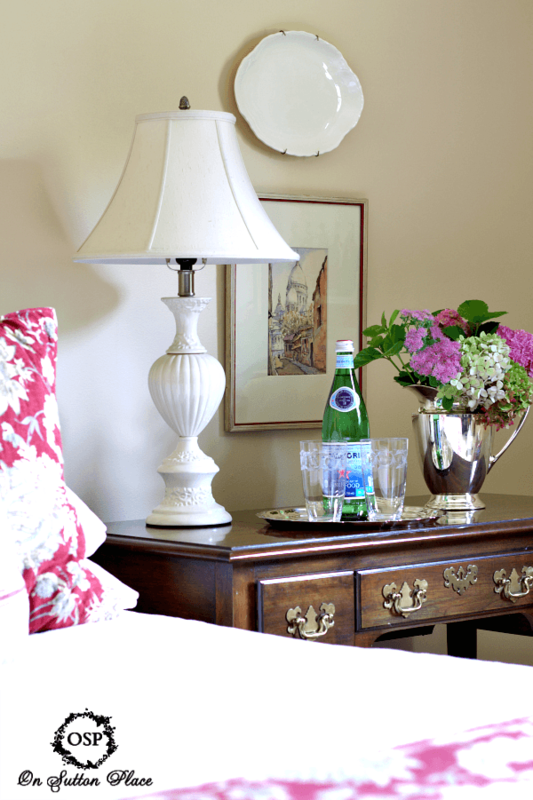 Your post definitively gave me some great ideas for a couple places to use trays…a guestroom and my kitchen. Thank you! Your home is lovely! 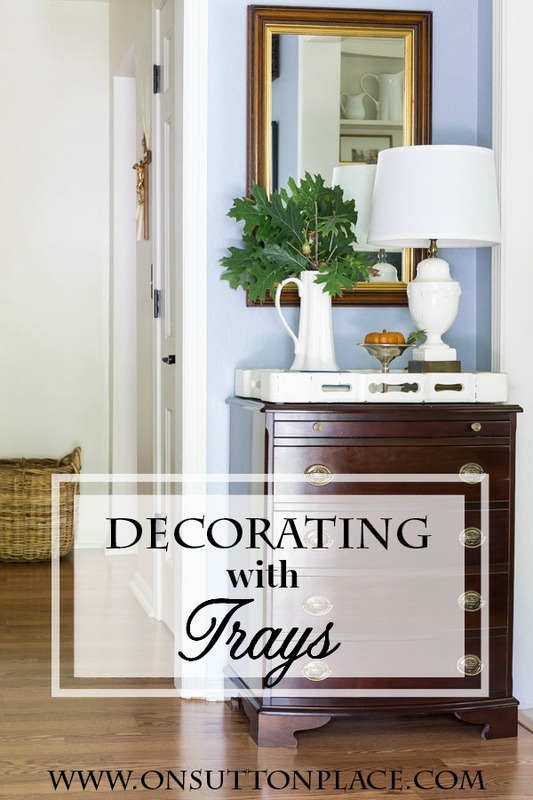 Tray inspirations are lovely from your blog. I’m using trays to corral items for a coffee bar like Yvonne for Thanksgiving and adding more trays at the dessert table. Anxiously awaiting for my new ” believe” pillow cover and clay tags. You know how I admire your workmanship. All so gorgeous!!! I have that same nativity set. My grandmother passed it down to me – she had it all through my mother’s childhood & I am so happy to now have it here. Neat to see it in other homes too. This article is so inspiring! I plan to visit my local antiques shop to find a couple beautiful trays that I can use. Thank you for these great tips! I love using trays and books in decorating. You have done a wonderful job with your displays Ann. I loved your use of trays. Any suggestions for a oak cabinet that I have in my bathroom? Something for fall? I get a lot of inspiration from your blogs and just ordered the clay tags for gifts. Thanks a lot. 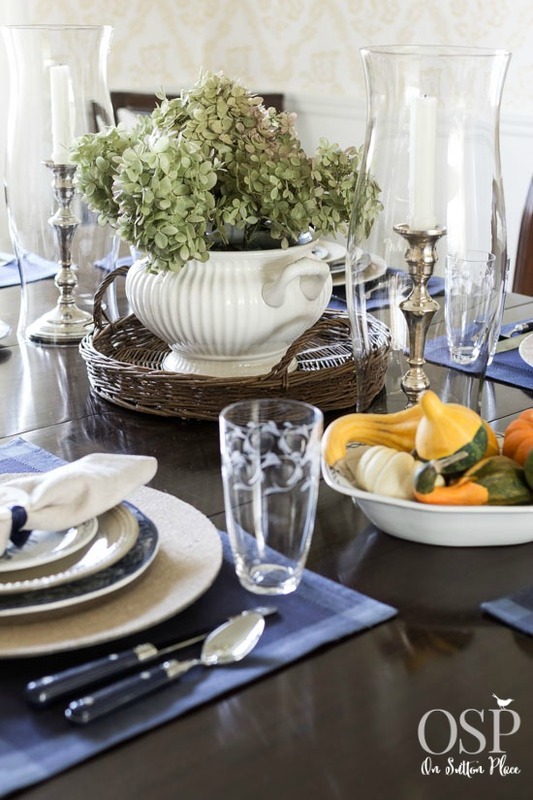 Love all your tips for decorating with trays! And Turner is right….books as trays are such a great idea! I never thought about books functioning as trays! I frequently stack a couple of pretty books and place special objects on top but you have just given me new insight into why that works so well. 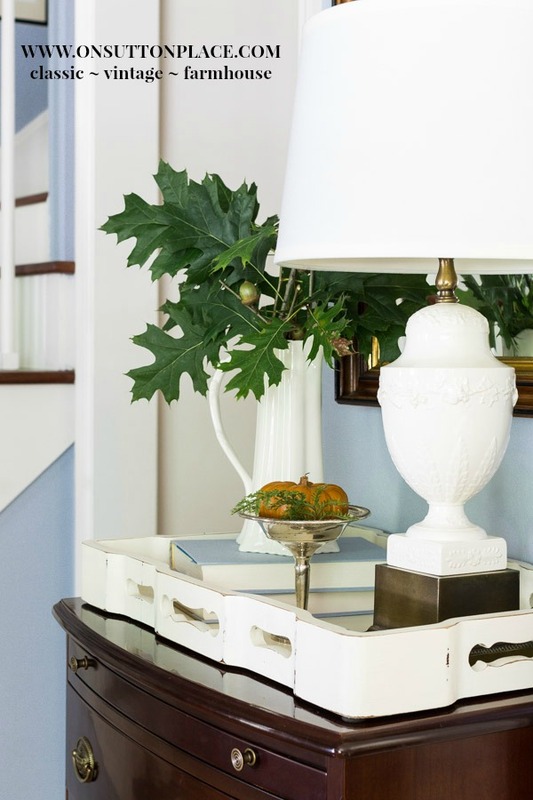 I love seeing the beautiful vignettes throughout your home Ann…love the ways you use your trays!